The USDA-NASS Prospective Plantings report indicated that corn planted for all purposes was estimated at 92.8 million acres, up 4 percent from last year. Soybean planted acres were estimated at 84.6 million acres, down 5 percent from last year. Though these estimates could change between now and when the crops are actually planted, it is still interesting to examine the impact of these estimates and associated crop prices on feed cost. Specifically, what are the implications of these planted acres on the prospects for swine feed costs the rest of this year? This article examines trends in feed costs as well as the impact of corn and soybean meal prices on feed costs for farrow-to-finish and swine finishing operations. It is important to note that the swine finishing enterprise represented in this article assumes the finishing of an early-weaned pig. The rations for the farrow-to-finish and swine finishing enterprises consist of corn, soybean meal, dry distillers’ grain, and supplements. 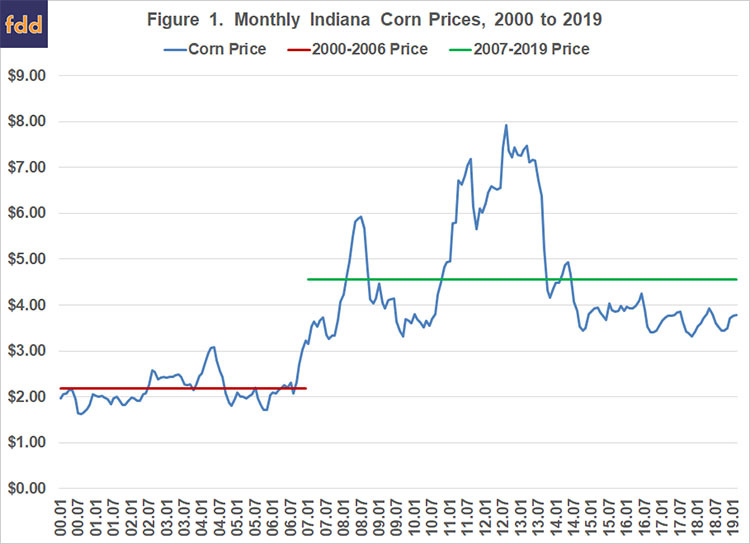 Corn prices represent averages for Indiana as reported by USDA-NASS. Soybean meal and distillers’ grain prices are obtained from Feed Outlook, published monthly by USDA-ERS. Information from Agricultural Prices, a monthly USDA-NASS publication, was used to compute supplement prices. Early April futures prices for corn and soybean meal were used to project feed indices through 2019. Feed cost indices are reported on a closeout month rather than a placement month basis. 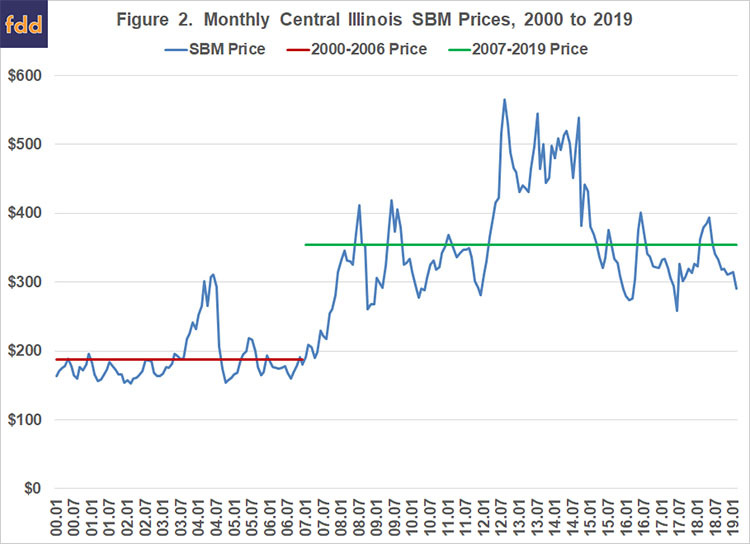 Figures 1 and 2 report monthly corn and soybean meal prices from January 2000 to March 2019. A distinction is made for prices before and after 2007. The period starting in 2007 is often thought to be a new price regime. Corn price averaged $2.18 per bushel from 2000 to 2006, and $4.56 per bushel from 2007 to the current month. Soybean meal price averaged $187 per ton from 2000 to 2006, and $355 per ton from 2007 to the current month. Corn price was above $4.56 from February 2008 to September 2008, from November 2010 to September 2013, and from March 2014 to June 2014. Since July 2014, corn price has been below $4.56 per bushel. Soybean meal price was above $355 per ton in June and July of 2008, from May 2009 to September 2009, in January and February of 2011, from March 2012 to March 2015, in July and August of 2015, from May to July in 2016, and from February 2018 to May 2018. Both corn and soybean meal prices are expected to remain below their averages since 2007 for the rest of this year. 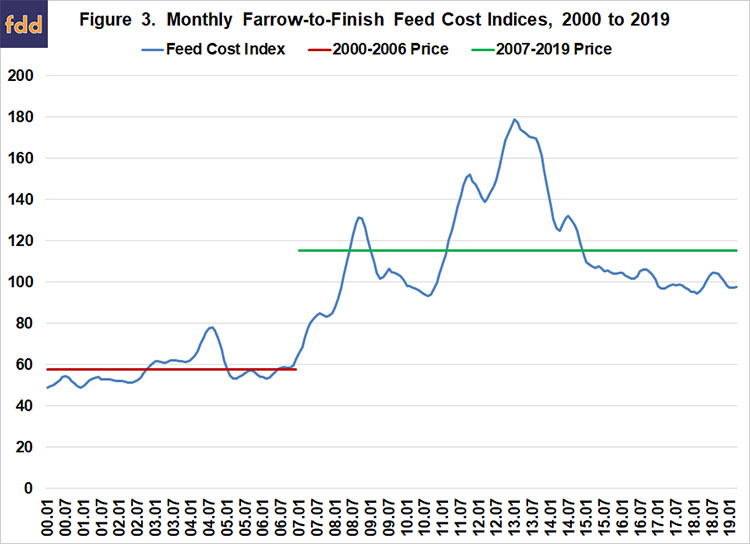 Figure 3 presents monthly farrow-to-finish feed cost indices from January 2000 to March 2019. The latest full year of indices, 2018, has an index of 100 so all indices outside of this year are expressed in relative terms. As with corn and soybean meal prices, a distinction is made for feed cost indices before and after 2007. The average index from 2000 to 2006 was approximately 58 while the average index since the beginning of 2007 was approximately 115. The index for March 2019 was 98, so current feed costs are 2 percent below the average for 2018. Projected monthly indices range from 98 to 100 for the rest of 2019. 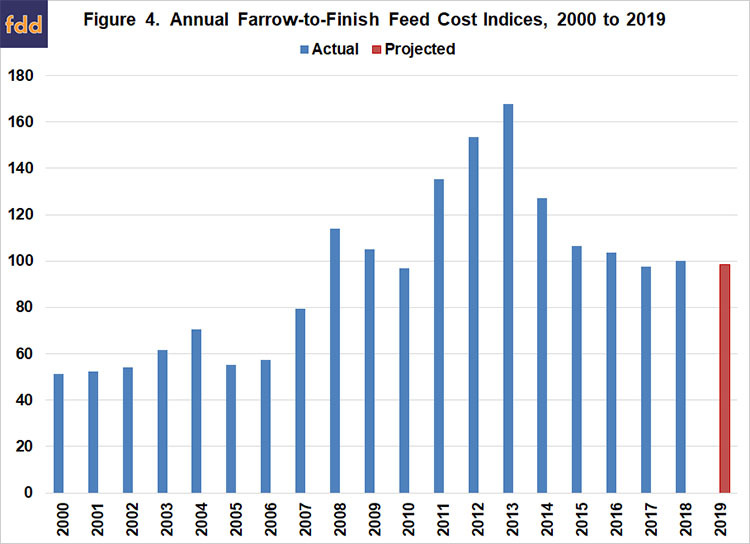 Annual farrow-to-finish feed cost indices are presented in Figure 4. The projection for 2019 (red bar) used corn and soybean meal futures prices in early April. The projected feed cost index for 2019 is 99. 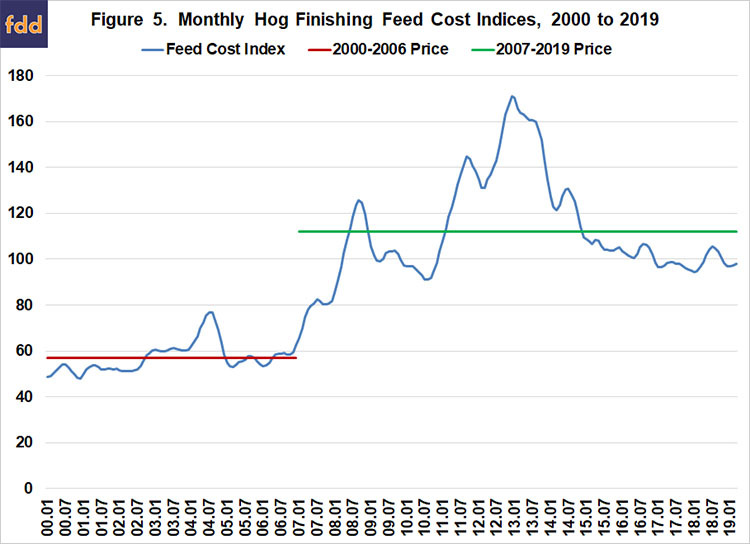 Figure 5 illustrates monthly swine finishing feed cost indices for the January 2000 to March 2019 period. The latest full year of indices, 2018, has an index of 100 so all indices outside of this year are expressed in relative terms. The average index for the 2000 to 2006 period was 57 while the average index for the period beginning in 2007 was 112. The index for March 2019 was 98, so current feed costs are 2 percent below the average for 2018. Projected monthly indices range from 98 to 100 for the rest of 2019. 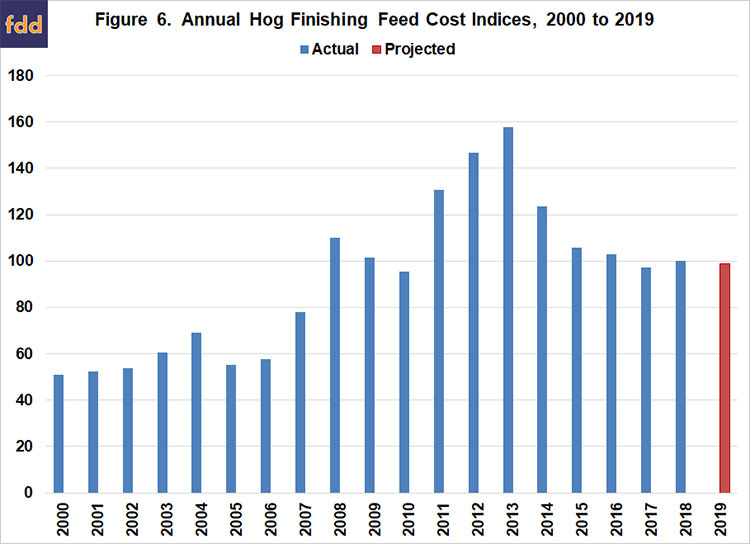 Annual swine finishing feed cost indices are presented in Figure 6. The projection for 2019 (red bar) used corn and soybean meal futures prices in early April. The projected feed cost index is 99. Thus, swine finishing feed costs for 2019 are expected to be very similar to those experienced in 2018. Using the iFarm price distribution tool, the probability of the corn futures price for December 2019 being below (above) $3.47 ($4.26) was 25 percent on April 9. This represents a spread of almost $0.80 per bushel. Feed costs are very sensitive to changes in corn and soybean meal prices. Regression analysis was used to examine the relationship between swine finishing feed cost, and corn and soybean meal prices during the January 2007 to December 2018 time period. Results are as follows: each 0.10 increase in corn prices increases feed cost per cwt. by $0.44, and each $10 increase in soybean meal prices increases feed cost per cwt. by $0.32. Obviously, a $0.40 increase or decrease in corn price would have a large impact on feed cost per cwt. Current feed cost is approximately $30.75 per cwt. Table 1 presents feed cost per cwt. for corn prices ranging from $3.25 to $4.25 per bushel, and soybean meal prices ranging from $250 to $350 per ton. At the lower range of prices, feed cost per cwt. would be approximately $26.25. At the higher range of prices, feed cost per cwt. would be approximately $33.75. This article discussed recent trends in feed costs for farrow-to-finish and swine finishing enterprises, and provided projections for 2019. Feed costs are expected to be similar to that experienced in 2018. This article also examined the impact of changes in corn and soybean meal prices on swine finishing feed cost. Each $0.10 per bushel change in corn price, changes feed cost by $0.44 per cwt. Similarly, each $10 per ton change in soybean meal price, changes feed cost by $0.32 per cwt.